Bi-Folding Doors offer you the opportunity to open up your home or conservatory and seamlessly merge your living space with your garden. 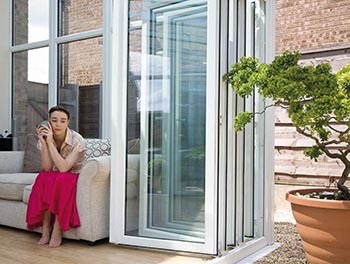 Add the WOW factor to your home or conservatory with a Bi-Fold door. Also referred to as Concertina Doors, Multi-Fold Doors and Trifold Doors. 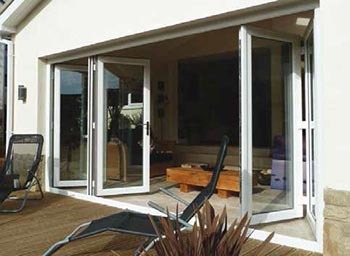 Bi-Fold Doors are often used in home improvement projects featured in magazines and television programs such as "Property Ladder". Bi-folding doors are now a very popular alternative to French or Patio Doors and a specified in many new home extensions as standard. This is due to the much wider unobstructed opening possible and the low threshold options, which make them ideal for use onto your patio or into your garden. Homeowners realise the added value this type of door will bring not just to their lifestyle, but also to help their property stand out from the crowd when it's time to sell. Our range of aluminium Bi-folding doors are manufactured from slim thermally broken aluminium profiles which provide strength and security allowing you to fold and slide the panels back to left or right and open up an unobstructed wide opening to your patio or garden. Available in a wide colour variation our aluminium range is manufactured from the renown Smart Systems Visofold system and is supported by a full range of aluminium windows and doors. Our Timber look Slim-Sash uPVC Bi-Folding Door has very slim sight lines when compared to most uPVC bi-folding doors. Available in a choice of colour options including Cream, Black, Grey and Green. These ultra smooth rolling doors run on maintenance free stainless steel rollers that are concealed inside a colour matched aluminium track fitted to the frame head and threshold so the doors cannot be lifted from the track giving you security and peace of mind.